While wandering through a field of stumps that was once a forest, a boy collects twigs and sticks and leaves that remain and decides to create something new. 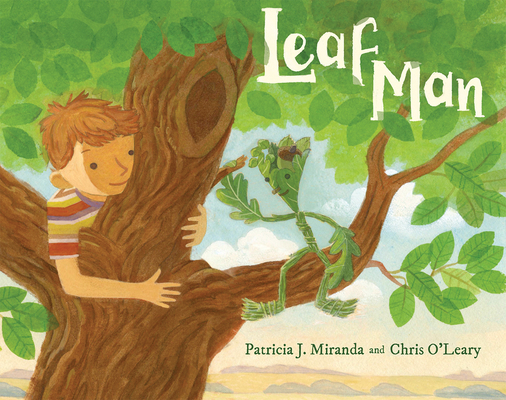 He makes a figure—a leaf man—who inspires him to dream and invent, to plant the seed for a better world. Based on the ancient folklore of the “green man” as a symbol of renewal, lyrical text and immersive visual storytelling fills this uplifting picture book with optimism for the future. Patricia J. Miranda's poems have appeared in numerous literary magazines including Hyphen, Frontier Poetry, and Yellow Chair Review. She lives with her husband, Chris O'Leary, and their two daughters in Ohio. Chris O'Leary illustrated Mama Played Baseball and other picture books. He lives with his wife, Patricia J. Miranda, and their two daughters in Ohio.